Most of this information is for the Astro Saber, but since the XTS3000 and its family are programmed by the same RSS, a lot of the information will be relevant for it too. All these radios use a standard SMA connector for the antenna. The radio end is a male. Be sure that you use a high quality adapter if you are going to convert from the SMA to something else. There are some cheap adapters that have a recessed center pin on the female side. This causes problems since the center pin on the radio may not make contact and you will be transmitting into an open (bad). The radio uses a third generation keyloader, there is a retro kit to upgrade the DES-XL key loader, and the data in and out pins are different. Only keyloaders with a model suffix DX or later will properly keyload an Astro, while BX & CX (as well as DX) models will work fine with a regular Saber. For keyloading, you use the same cable as a regular Saber, TKN8506, and the pinout is available here. The part number for the HHCH for the XTS3000 Vehicular Adapter (XTVA) may be PLN7737A (unconfirmed). Here you can find the Astro Portable model breakdown chart. Note that it is the same as the one for the mobiles, except for the available power levels and the "H" at the beginning of the model number to denote portable. You may also want to look at the Saber Page. Take a look at the programming cable for the Astro Saber. The programming cable for the XTS3000 and XTS3500 is the same as the other Jedi radios, RKN4035A, and its pinout can be found here. By the way, if you thing you can make yourself a cheap cable by just ordering part number 0960113A07, well, forget it. The current list price for that item is $166US. There seems to be a number of people interested in the Astro Sabers that the LAPD uses. This section will try and answer many of those related questions. First, the radio that the LAPD is using is the H04SDH9PW7AN. You are probably better off not trying to get Motorola to flash your Astro Saber "just like LAPD's". Motorola considers FlashCodes 840101-8F0000-4 and now 540001-070000-7 to be RESTRICTED. If you send in a radio to the depot for service with one of these flash codes, they will only send it back with H35 and you have to buy any upgrades you want for the radio. 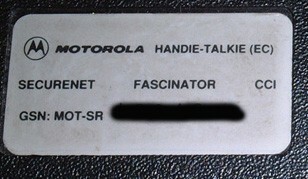 If you do try to get that flashed into your radio, Motorola security may get involved and start asking questions. Although it IS legal to ask about it, Motorola may not do it and may get nosey. There is not much they can really do, since you are only inquiring about it. Remember though, that if you are fishing for FlashCode info while talking to Motorola, and you give three codes in a row with invalid data (including the last checksum byte), you will probably find yourself transferred to someone in Security to speak with. Now you know. If you want to have your radio working close to a LAPD model, have your radio flashed with something similar, by dropping one of these options (one of the lesser important, like H869, since you'd not likely get your hands on keys anyways). If you want to just be able to monitor the LAPD, you need a FlashCode of at least 100001 000000 1 (guessing at the checksum). This gives you options Q806 and H35. Those are the minimums. If you have any conventional Astro with a first digit FlashCode that is odd, then you should have option Q806 and be able to monitor the LAPD. The rest of the FlashCode shouldn't really matter all that much. Modat can in fact be used with both IMBE and VSELP radios. It's Software Encryption that can't (isn't supposed to) be in an IMBE radio. There is no such thing as "Astro encryption" as such. The encryption types that can be used in an Astro system are the same types used in standard systems... DES, DES-XL, etc. An Astro Saber can be made to operate just like the LAPD codeplug (old version) does. You need to program in the RSS one astro channel (you can delete it later). In that channel screen, go into Astro options (F6) then (F7). Disable both the OTACS and OTACR options. Under that you will see a table. Make sure that the CCS Pos 1 is set to Zone 1 and Channel 1, and set CCS 2 to Zone 1 Channel 2 all the way to position 16, or the channel selector WILL NOT work properly. This must be done with LAB for the LAB options. Under the hidden LAB options, you must change the band to what the radio has in it. You will also need to have a codeplug that will work with the radio in the service menu in normal RSS. The serial number needs to be the same. What you will have to do after the "upgrade" is to load the old codeplug into normal RSS and go into the service menu. Program the old values back into the radio. DO NOT READ THE RADIO FIRST - LOAD THE OLD CODEPLUG FIRST. This way the values from the old plug will override the values in the plug that you just loaded into the radio. Its the TX/RX alignment screens that you need to deal with. If they are not changed, your radio will not properly lock, hence useless. Make sure in lab that you change the codeplug model/serial numbers to the one your radio is assigned with. Makes life easier in the future. The best thing to do is the erase all the old info prior to loading it up. If you leave all the old info and program the radio, you may not be able to access certain screens. This upgrade has been performed two ways, and they both worked. One was to use the CLONE menu, and the other was the straight F8 program radio menu. Both most likely do the same thing. REMEMBER: Always keep a backup copy around.....just in case! In the right column, a field is listed called "RX unmute rule"
If you want to determine whether your radio is VSELP (Vector Sum Excited Linear Prediction) or IMBE (Improved Multi-Band Excitation), look in RSS at the Astro ID number. Try changing the ID. If it will not go above 16773119, it is a VSELP. An IMBE radio will let you use anything up to ID 99999999. You can convert a VSELP radio to IMBE if you have the version F, or G vocoder boards (1 Meg Boards) in other words any radio with a 1 meg vocoder can be converted be used for either IMBE or VSELP but not both. IMBE and VSELP radios are both capable of using software encryption. MODAT can work on VSELP mobiles and portables. iDen is VSELP based. It allows for up to 6:1 compression using TDMA (Time Division Multiple Access). We have reason to believe that TDMA decoding is a built-in function of the Astro hardware, part of the modulation scheme. Although, this information is not documented in the software or mentioned in the service manuals (we are still trying to confirm all this for sure). We have been told that there may be able to monitor iDEN radio traffic using an Astro Saber. What you need to do is take a VSELP Astro of the appropriate band and cram an IMBE codeplug into it (using Lab or whatever). The theory behind this being that you should be able to use the "digital squelch" options of the codeplug, along with the VSELP hardware to monitor the traffic. We have no idea if this works for sure or not, but hey, you never know!. First off, it appears that every XTS-3000 has a 1M vocon board. The ASTRO Saber's on the other hand could have either 512k or 1M. In a fully compliant, Project-25, Astro, digital tunking system (9600 baud control channel, etc. ), you must have a radio with e 1M vocon board, and the HOST firmware version must be equal or greater then R07.00.00. For every HOST firmware version, there is a matching, correct, DSP version to go with it. There is no way to get HOST version R07.00.00 in a 512k radio. The highest HOST firmware version that a 512k radio will take is R05.60.00. And, the matching DSP version for this 512k radio is R06.05.04. If those matching versions are are not present together, you may find that some features are missing or not working correctly. Radios which are correctly programmed, and upon reading show ???????? in certain fields are probably affected with this HOST/DSP firmware mismatch problem. Any radio that displays "UNKNWN" in the self test sequence is one that may have been incorrectly field upgraded, or maybe hacked. It pretty much means that the radio has had its feature set changed by possibly an unapproved procedure. It is possible that this could have been done at the depot or factory when a quick change/revision was necessary, but the correct tools were not available. You will find that only radios that have version R04.00.00 or higher HOST firmware are capable of showing the "UNKNWN" error, or the vocon board size (512k or 1M). If the radio has the "UNKNWN" error, it will usually replace the field that would show the vocon board size during the self test sequence. Note that these flash decoding tools have been updated recently, and should be pretty accurate. Getting flash upgrades is nearly impossible unless you're an original purchaser of the radio from Motorola directly. Officially, they don't sell any flash upgrades to any secondary market radios. Exceptions are rare. The Astro Saber uses a small, recessed, plunger type button, just under the retaining screw receptacle on the radio. This is how the radio decides whether to use the internal or external antenna, when pressed in, it selects the external antenna. We have heard the question often, "What's the difference between an Astro Saber Vehicular Adapter (AVA) and a normal Saber Vehicular Adapter (SVA)?". The front panel of an AVA IS physically different than the one on an SVA. If you look at the bottom area of the accessory connector on an Astro Saber you will notice that there is a raised area (bump) on it. That bump is there to keep you from putting an Astro Saber into an SVA. The AVA's front panel has additional clearance in that spot to allow the radio to enter. Furthermore, the firmware chip in an AVA is believed to be an updated version of the firmware in an SVA. The main boards in both the AVA and the SVA may be the same otherwise. The firmware changes adds the support for the Astro. An AVA has been confirmed to be UNIVERSAL to ALL radios that carry the Saber name of any type. Astro Sabers, Sabers, the Saber SI, and Systems Sabers will work in an AVA. You can switch display microphones as required for the individual radios. That is not true of the SVA. To date, no ConvertaCom for any RUGGEDIZED Saber series radio of any description has ever been sighted. The part number for the Astro AVA is NTN7227BSP01. Other revisions exist, in which case the B in that part number is replaced with a C, D, or E, which is the most current version. One thing to note when using your AVA, if you pull the radio out while it is on, you may loose your volume control (any other controls). This may be intentional, or it may be a firmware issue. Since the AVA doesn't know when you are going to remove the radio from the cradle, it can't completely return control of the radio to the user before it is detached. As a result, some radios still pretend that they are in the AVA, and don't respond to user controls without a power cycle. On the other hand, there are some radios that seem to work fine some/all the time when they are pulled out of the AVA. This points to the firmware in the radio and the newer revisions may be able to compensate for the loss of the AVA control without the radio being power cycled. Just something to be aware of. The following applies to all DOS versions of Astro RSS. For Windows CPS, check here. Both these files are write-protected, and that protection must be removed before editing them. You can use Windows Explorer to do this (by using the File/Properties menu). You can also navigate to the file through My Computer and right click on the file to access the Propertied menu and then de-select the read only attribute. So now you have two unprotected .ODB files. Use a Hex editor to make the changes. Open the file you want to edit, and using the search or find functions of the software, search out the ORIGINAL band limit of interest to you (eg. to pick the lower end of UHF 450-520 split use "450.0000"), and having confirmed that it's there, do a global search and replace of that band limit with your intended limit, example take it down to 430.0000. You want to do a global search because that way you make all adjustments you need at once, transmit, receive, and every other place the software looks. If you need to, make sure you are doing a text search or ASCII search for the string. Save the files, run the software normally and enter your new out of band frequencies that will be accepted and programmed. If it's a reasonable change, the radio will take it and it will work. Some people have had success taking a 450-520 radio down to 430.0000 (haven't tried any lower than that) and have taken it as high as 535.0000. Your mileage may vary. What you need is an OLD codeplug from the same radio, or type of radio, that you want to use with older software. The model number needs to be the same, and the FlashCode should be the same (this has not been tested with radios and files of differing FlashCodes, it might just complain, and then again it might end up in a paperweight radio). Load that codeplug into the Depot RSS. Add your channels, scan lists, etc. Go into the hidden LabTool menus (F9 works in places where the area over the F9 button is blank like there's no feature available) and make whatever changes you want. LabTool Configuration 2 will allow you to put up to 16 software encryption keyslots into the radio if software encryption is set up in your radio (Multikey Operation), but if you try them out, you will find that they are really only the first five keys repeating over and over. From here, you can even change the controller's operating frequency band from VHF to UHF low or high, or 800 MHz (not to say that it will actually work there since the RF sections are different, but it is there anyways). As a side note to all this... one interesting thing to note about this procedure, you could use it to transfer codeplugs between different radios. The reason this would be useful is if you have an RF board that needs a controller, but all you have is an old archive from the radio and a controller from a different radio with the wrong bandsplit that you want to use. If you took that codeplug and loaded it into the donor controller using read/write with no pack/unpack, you could in effect re-initialize the controller. There are limitations to this, though. The HOST and DSP should be similar if not exact between what the codeplug you are using is set up for and the controller you are dumping it in to. If they are different, it may not work, or you could kill the donor controller. Proceed with caution, and always have a backup codeplug in case you screw up. There are several references to an SP version of the Astro Saber that is equipped with Fascinator Securenet, AND works with GE/Ericsson's EDACS format trunking. The word is that this ultra-special radio was created in response to a Marine Corps special requirement for a radio that would work with their land based EDACS system and would also have Fascinator encryption in conventional operation for (mostly) tactical and/or offshore operations. Fact, or fiction... who knows at this point. Motorola was able to supply this item because Ericsson doesn't have authorization to produce or have Fascinator encrypted technology since they are not a US-based company. Supposedly this special radio type is in use at a Marine Corps base in the vicinity of Corpus Christi, Texas. We have been advised that such a radio does in fact exist, and has been confirmed. As to any further details on the unit, SP number, flashcode, model number, etc. have yet to been provided. The true capabilities of the radio are not known, but it looks like the Fascinator part is true, click to see the radio label. You will find that version 3.04 Astro Depot Lab software is perfectly capable of doing a direct read/write with no unpack and S-record conversion on all radios (of this type), even on radios that have been programmed with the newest software. You can also transfer the codeplug you read to ANY OTHER radio of the same type, regardless of the version of the programming RSS, but you have to use the read/write without pack/unpack menus. Do not attempt to unpack, edit s-records, or anything, just do a straight transfer. If the hardware and firmware are compatible, it'll work. But it completely clones the radios, and overwrites the old codeplug information in the target radio. Model, serial, the whole bit. You would probably want to try and correct those IF you can. As far as editing the codeplug with the Lab RSS goes, there really isn't much you can do if you have a newer codeplug. You can NOT unpack the newer S-records with this software, so there are no changes possible this way. All you get is a block type mismatch when it tries to do the unpack (it expects a different S-record layout). As a result, you can't use Lab to open and edit the features stored in the S-records directly. The new type S-record layout, and the one the Lab RSS expects are sufficiently different that a direct comparison between two codeplugs of IDENTICAL content but written with different software shows the two files to be very different, to the point that comparing the two by hand would be virtually pointless. On another note... a dead UHF Astro Saber was sent into Motorola for repair*, it came back working, but with a totally basic FlashCode. This radio was a good candidate for experimenting. This "useless" radio was read (with new enough regular RSS) and the codeplug file saved (just in case...). A different Astro Saber was read with Lab, and CLONED it directly into the new radio. The full clone explained above took place. The serial number and everything else was transferred into the target radio. This included the FlashCode. Once again, the trick when you are doing the transfer is NOT to unpack the data. Leave it packed during the trip from one radio to the other (read/write with no pack/unpack). MODAT SIGNALLING NOW WORKS (the cloning source radio has MODAT). Software encryption transferred, but it is really STRANGE now. It is not usable because the noise coming out of the other radio sounds like insane crickets in a blender. Chirps, squeals, all kinds of odd noises. The reason why software encryption can become non-functional in a cloned radio is because of a version mismatch for the DSP in the radios. It must be of the same version if they are to work properly. The DSP processes the audio differently in software encryption mode, depending on the DSP version. So if you have two radios with different DSP versions and you clone software encryption enabled codeplugs into them, the radios may not work properly in software encryption mode, but they should be fine if their DSP versions match. The transfer may have been a one way street. Newer software DOES check the FlashCode before cloning and it wasn't possible to get the old software to read the newer codeplug. No clue as to whether or not this trick will work on all radios. It is presumed that cross-FlashCode cloning will work perfectly on any radios that are VSELP based. The Lab RSS is merely a tool for reading and writing to the radios in the most basic of modes, and could really care less of what all the features are. So, this version of RSS CAN be used in place of the FlashPort system in some situations. Provided that you understand that this is an all-or-nothing cloning operation at this time. For example, MODAT WILL transfer, and so will some other features, but no clue as to exactly which ones, yet. However, IMBE/VSELP conversions are NOT going to happen this way. We are under the impression that this technique will work on H-options, not Q-options. We believe that Q-options actually require reprogramming the firmware in the radios, and H-options merely need to be switched on and off. Q-option changes would absolutely REQUIRE a SmartRib and upgrade files, since the programming voltages for the firmware chips need to be provided externally if Motorola is to be believed. An Astro Saber with a problem was recently 'converted' from one band to another (800 to VHF in this case) using Version B03.04.00 Lab software and the 'hidden menus', and replacing the RF deck with the right one for the new band. It is important to adjust the model number to be correct for the new band or the 'normal' software may not recognize the radio. The results of this experiment? Success. Astro 8.5 has no problem with this radio and it seems to be normal in every respect for a radio with this feature set. Again, this must be undertaken with great caution, the HOST/DSP versions need to match or be very close (see above) or you get a paperweight. This does not change the FlashCode in the radio, but if the firmware in the target controller is high enough, it can work like a charm. Newer versions of Lab RSS do exist. Supposedly there is one around version 5 or so, as well as one that is around version 8. We do not know anything about the capabilities of these versions of software, other than they are out there, somewhere. We have heard that the version 8 Lab RSS is VERY tightly guarded and protected. I is supposed to be able to be installed only on one computer at a time and the disks are copy protected. Rumour has it that this version has the capability to generate FlashPort upgrade packages, and has the ability to get new HOST and DSP firmware packages for integration into the FlashPort upgrades. This is all rumour of course, and it would be one nasty thing to get caught in the un-authorized possession of... you'd be in prison for a LONG time. *This was an unusual case because they actually accepted the radio for flat rate repair, and actually did the work on flat rate. This is not typical for a radio that is privately owned. If you have a shop send in the radio, you'll pay a service charge, but your chances of getting a flat rate repair are much greater. We have heard from some of the users of the new CPS. The initial evaluation of this software follows. On the down side, the Astro CPS is hard limited to accepting a maximum of FIVE software encryption keys (part of the Multikey Option), while the DOS version will accept up to 16. A UHF Astro Saber (an LAPD one) got tweaked to have 16 keys instead of the default five, and the CPS won't read those radios (errors out) until the default setting of five keys is restored via lab. This isn't really a problem though. It has been determined that even if you have more than five keys programmed into the radio, if you actually try them, you will find that there are really only five keys, and after number five they just repeat starting at key one. So, having to go back and correct the radio to the default of five is no great loss, since it appears that the hardware doesn't support anymore anyhow. Now, as far as out of band hacks go, some progress has been made. You can check here for details. The radios that are capable of displaying lower cased letters are caused by manually editing the codeplug file. We know of someone who has done it this way, and it works just fine. However, it is not an easy task, and takes a lot of time to edit. Note: If the corrective action does not fix the failure, replace the controller board. NOTE: All displays are temporary and will expire without any user intervention. If information is longer than the physical length of the control-head display, the information will wrap around to the next display. After the last display, "RF TEST" will be displayed. Press Side Button 1 to stop the displays and put the radio into Control Top and Keypad test mode. The test mode menu "CH TEST" will be displayed. Note: Each press of the Side Button 1 will toggle between CH TEST and RF TEST. Available chemistries are NiCd or NiMH. Nominal Voltage: 7.5 volts. Range: 6-9 volts.